Here's a sample of what I've started working on. While my friends argued back and forth, my mind sank back into the mire of my discontentment. I didn’t stay there because Brianna squirmed on my lap and sat up rubbing her eyes. She was my pride and joy; the best thing to come out of my relationship with Bryan. Now eight months old, Brianna was a sweet combination of her father and me. She smiled, showing me four teeth which had made her miserable over the last few weeks. Holding up both hands, she reached for her father who sprawled behind me. I picked her up, shifted to one side, and dropped her on his lap. She held on to his shirt and pulled herself up to stand. 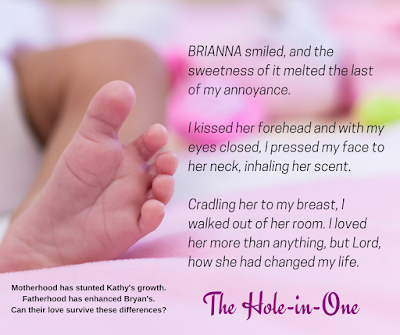 While she gurgled at him, Bryan spoke back to her, protecting her with his hands at her back. The loving light in his eyes and the tenderness on his face reminded me of all the reasons I loved him, but my feelings were no longer enough. Matter of fact, they had led me astray and here I was, stuck in Nowhereville. His gaze lifted from Brianna and he looked sideways at me. He cocked one eyebrow as if he was curious. I realized then than I was frowning. My attention went to the television when Garth yelled at the footballers onscreen and his fiancée, Anna-Lise rolled her eyes. They were getting married in August, which was another reason for me to be annoyed with Bryan. It wasn’t my intention to force him into anything, but I didn’t understand how he could be so clueless, unless he didn’t think I was the one. I sighed, watching him playing with Brianna. My mind was dragging me all over the place, which wasn’t a good thing. Bryan and I loved each other. We both knew that. Maybe I needed to reopen the discussion about where we were going with our relationship when the time was right. Stewing over it wasn’t doing anything other than putting me in a sour mood, and that had been the case for a while now. “What about this pineapple-upside-down cake you promised us?” Vance asked, pulling me out of my thoughts. “You can eat the way I do when you’ve got good genes.” Vance grinned at me from the love seat. We’d invited the gang over to our house after work for one of our usual Friday get-togethers. They kept me sane and our gathering was something to look forward to after being home with Brianna all week. It will be interesting to read their story and see how having the baby has affected their relationship. Thanks for dropping in, Sally. I think they'll have an interesting story to tell.